Compare prices on car hire in Tromsø from all the major brands and find the best deals. When you book through us, unlimited mileage and insurance are always included in the price given. Tromsø (55,000 inhabitants in 2009) is the largest city in Northern Norway, and is situated in Troms county. The city was founded in 1794, and from the 1800s was the center of the arctic in the Arctic. Tromsø is the largest city in the Nordic countries north of the Arctic Circle, and also a popular destination to experience the midnight sun in summer and northern lights in winter. 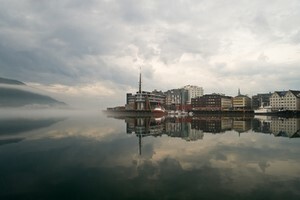 The city center is located on the south side of Tromsø – and connected to the mainland by the Tromsø Bridge and Tromsøysundtunnelen. The port of Tromsø has daily arrivals of Coastal Voyage ( Bergen – Kirkenes ). Tromsø is a university, and has a rich cultural life with museums, art galleries, concert venues and several annual festivals. Arctic Cathedral from 1965 is the city’s landmark, with its unique architecture. Other attractions in Tromso include Tromsø Cathedral from 1861, the Polar Museum (which tells about the city’s past as a center for arctic and starting point for expeditions in the Arctic), Tromsø University Museum (North Norway’s largest museum of natural and cultural history), North-Norwegian Museum of Art – and Polaria, a adventures with themes of the polar regions. There are also aquarium with live seals and fish from the area. The site also shows films from Svalbard. Cable Car to Big Stone (421 m) is a popular tourist taking action, and from the top has fantastic panoramic views over the city. Tromsø has otherwise good shopping at stores and malls and a bustling nightlife. Tromsø Airport – Langnes is located 3 miles west of downtown. Car hire can be booked in the city of Tromsø and the Tromsø Airport .Some rental cars we offer in Tromsø Agoda Toyota, Peugot 207, Ford Fiesta and Audi station wagon. Van can also be ordered if you need seats for more than 5 people.